A friend who always seems to find oddball motorcycles (or perhaps they find him at this point) discovered a strange scooter of German origin. As usual, it needed some work, but it was unique and interesting. Heinkel produced their first two-wheeled vehicle in 1954. It was a scooter that they called the Tourist. It featured a 175cc four-stroke engine with 12 volt electrics and an electric start. This was an impressive list of features at the time, and positioned them well in the market. They enjoyed years of healthy sales, and introduced a 150cc 2 stroke scooter as well. This did not sell nearly as well, nor did a 50cc moped called the Perle. Much of Heinkels's hopes were pinned on success in America. 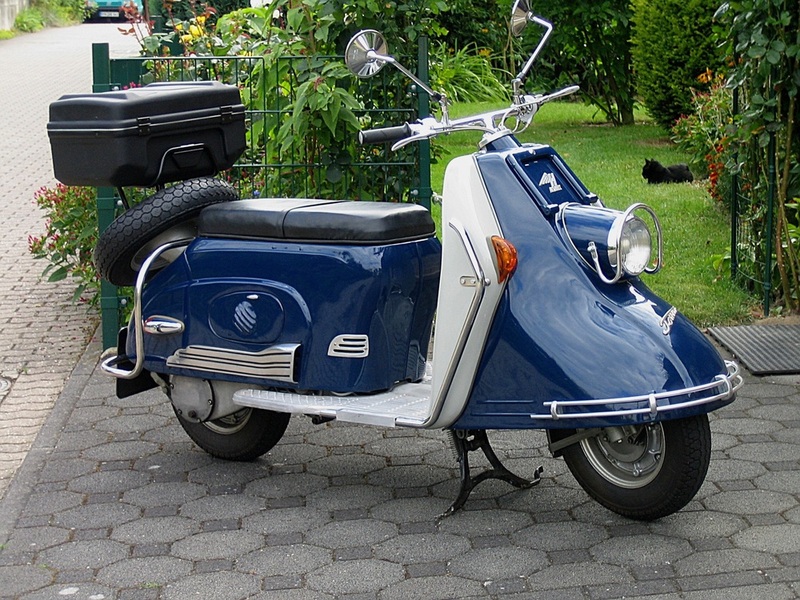 However, the product was relatively expensive, costing more than a Vespa or a Lambretta. Dealership woes also plagued the brand, and by the time they were sorted out, the peak of the scooter era had passed. They were also right in the midst of Honda's legendary "You meet the nicest people....." campaign. Production lasted just over 10 years, ending in 1965, but there is a healthy club scene in several countries.